The Cushing family businesses started in Calgary in 1885, with a factory on 1st Street and 11th Avenue SW for making windows and doors. It was said to be the first factory in the Northwest Territories. This factory, founded by William H. Cushing, was ultimately was part of a family-owned network of mills operated across the west by the Cushing brothers and their families. Many older Calgary homes have sashes, windows and doors that were made by the Cushings. A.B. Cushing Mills, started by brother Alfred in 1911, remains in business to this day. The Hon. William H. Cushing served as an alderman from 1890 to 1904, including a year as mayor from 1900 to 1901. When Alberta became a province in 1905 he served as the first minister of Public Works. The Cushing Bridge in east Calgary is named after W.H. and the Louise Bridge is named after his daughter, who had died at a young age. Alfred B. Cushing was also active in civic life and was elected to City Council in 1911. This residential turned commercial building is one of two remaining structures which have a direct relationship with the first and second generations of the Cushing family in Calgary. The house was built on Lot 20 in Block 100, Plan C.
Ellen Cushing originally purchased the lot between 1900 and 1904. George C. Cushing resided at 1313 Centre Street S. beginning in 1909. The son of John and Ellen Cushing, and nephew of W.H., A.B., and Arthur Cushing, all of Cushing Bros. Ltd. George had lived in Calgary since 1893 and had previously resided in the home of his mother at Lot 19 in Block 100, Plan C, or 101 13th Avenue S.W. (recently demolished). Beginning in 1908, George worked for his uncle W.H. Cushing’s company, Cushing Bros. Ltd. In 1909 George was employed as a chief salesman with his uncle’s firm. By 1911 he held the position of assistant manager, local manager in 1912, and in 1913 he was appointed treasurer of Cushing Bros. Ltd. In 1916 George C. Cushing transferred to Regina, Sask., where he acted as local manager until 1930 of the Cushing Bros. Ltd. branch that was located there. Sadly, George was killed in an automobile accident on October 26, 1930. George married Sarah Minetta (Nettie) McKernan in 1906, and they had their first son, Reginald Clarence, in 1910. In 1920 they had their second son, Clifford John. Lance Corporal Clifford John Cushing was killed at the Battle of Normandy, France, in 1944. The building is a two-storey wood frame structure with gable roof lines. The unique design is asymmetrical and incorporates a covered porch and main entrance between two perpendicular wings. Above the porch, a square tower extends upwards and is accented by a finial. The exterior walls retain their original wood siding and architectural shingle details. The soffits exhibit detailed woodwork, as do the projecting gable eaves. The house also retains original window details such as latticed and leaded windows, as well as sashes, which likely came from Cushing Bros. Ltd. or A.B. Cushing Mills. Since the majority of the Cushing family’s buildings that were once located in this city have since been demolished, this is the best example of domestic architecture relating to the prominent Cushing family in Calgary. The Cushing residence was recently added to the Municipal Inventory of Potential Historic Sites (category A). Alfred Bruce Cushing established the A.B. Cushing Lumber Company in Calgary, Alberta, in 1911. He was born in Kenilworth, Ontario, on November 9, 1865. Alfred pursued higher education and received a B.A. (Honours in Classics) from Victoria College and the University of Toronto in 1893, the same year he married his wife, Elizabeth Wilkin. He taught high school in Essex, Ontario, until 1898, when he taught at Brandon Collegiate Institute for two years. Prior to developing his own business he was an involved member of Cushing Brothers Limited, the company founded by his brother, the Honourable William Henry Cushing, in Calgary, in 1885. In 1900 he joined his younger brother Arthur, in Edmonton, in expanding Cushing Brothers Limited. He moved to Calgary in 1905 to manage the head office of Cushing Bros. Ltd., but remained vice-president and manager, and later secretary-treasurer of Cushing Bros. Ltd., in Edmonton, until 1910. Within a decade they had accomplished electrification of the plant and the firm was employing about 150 men and many horse teams. In 1911 he opened his lumber company at 1301 10th Avenue S.W. after a six-year association with the local sash and door factory (Cushing Bros. Ltd.). He was now President and General Manager of his own company. Alfred’s sights were not set at this. In 1926 he expanded A.B. Cushing Lumber Co. by amalgamating with R.L. Cushing Millwork (Moose Jaw) and Masterbilt Doors, B.C. Cushing Mills, and North Vancouver Sawmills (all of Vancouver); the name of the new conglomerate was A.B. Cushing Mills Limited, and formed one of the largest manufacturing concerns in Western Canada. The new company remained at the 1301 10th Avenue S.W. office until 1929. Alfred also had a conscience for public involvement. In 1911 he was elected as an alderman for the city of Calgary. He was also treasurer and member of the Executive Board of the Alberta Sunday School Association. Alfred also acted as chairman of the Calgary Symphony Orchestra and Apollo Choir. In 1934, the year of his brother William’s death, he left Calgary for Vancouver, B.C., where he died on December 14, 1944. Unfortunately none of his Calgary residences, or his factory and offices at 1002 14th St. S.W., remain, leaving 1301 10th Ave. S.W. 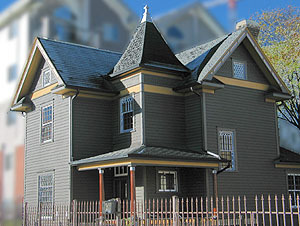 as the only structure in Calgary with a direct association to Alfred Bruce Cushing. It can also be assumed, although no direct evidence exists, that the site has a secondary association with the Honourable William Henry Cushing. The relationship between Alfred and William, which was both personal (brothers) and professional, likely, resulted in William’s presence at the site on numerous occasions. This is important because very few sites remain, today, which have a direct relationship to the Honourable William Henry Cushing and his legacy. William Henry was the Cushing family figurehead in the West. William was born in Kenilworth, Ontario, on August 21, 1852. He arrived in Calgary in 1883, and by 1885 he had begun his construction business in the growing settlement. Two of his first contracts were for two East Calgary churches: the Presbyterian and the Methodist (later known as Cushing Memorial Church; and now, Trinity United Church). In 1904 William bought a factory in Edmonton and formed Cushing Brothers Limited. Business soon grew and he bought an additional factory in Regina, built a new factory near the site of the Cushing Bridge in Calgary. The building is a two-storey masonry structure with parapets at the north and south ends. Originally exposed brick, at least one of the exterior walls has been painted. Pilasters, string- or belt-course masonry, and six large windows (three per storey) accent the building’s front façade. The window in the centre of the front façade has replaced what was originally a door. There is also a corrugated steel addition loading platform addition that was completed in 1952 when the site was the home of Pedlar People Ltd., sheet metal workers (1930-70). Throughout the 1970s and 1980s the building retained its industrial association through its use as a warehouse for Standard Metal Products. Updated August 2007: Personal Best Seminars Inc. purchased the building in 1992, and has leased space to many other groups. The retail space has been home to Inspiring Grounds Coffee Shop, the Cozy Corner cafe (2006), and most recently the 80/20 Cafe (summer 2007). For more information on the history of the building since 1992, see the letter below from the building owner. Kudos to the owners for preserving this part of Calgary history! This building was recently added to the Municipal Inventory of Potential Historic Sites (category B). * Thank you to the Beltline Communities of Victoria and Connaught for supporting this research as part of the Beltline Heritage Inventory Project (B-HIP). added to your website and records (Category B Heritage Status). main tenant who leases out space to various other organizations. Cafe ) with new signage coming soon I imagine. though and appear to be quite fascinating to people. tears to think about it. Cafe 80/20 is now open in the old A.B. Cushing Mills building (Personal Best Seminars Building) on 10th Avenue/12th Street SW, across from Community Natural Foods. Time for coffee and more in a historic setting. "and the Louise Bridge is named after his daughter, who had died at a young age." For many years I have been under the impression that the Louise Bridge was named after Louise Riley who died at a young age - of the family who's name is on Riley Park, the Riley Mansion on 24th [Crowchild Trail -the house has now been moved several blocks west] and St Barnabas Anglican Church where some of the family is buried including young Louise, not far from the bridge she is named after in Sunnyside. This afternoon the Calgary Fire Department responded to reports of a building fire in the 1300 block of 10 Avenue S.W. When crews arrived smoke was billowing out of a two story building where a restaurant is located on the main level. Approximately a dozen staff and patrons had safely evacuated the eatery. When firefighters entered the building they were met with a large amount of fire in the kitchen and command prudently struck a second alarm for more apparatus, equipment, and manpower. After an aggressive interior attack the initial crews were able to knock down the fire immediately. Crews began salvage and clean-up after the fire was doused. The cause of the fire is currently under investigation and the initial estimate of damage is $25,000. A lively Valentine's flambee at Petite (1301 10 Ave. S.W. 403-452-5350) has spurred a whole chain of events. Chef Jared Alvey and his kitchen team were firing up some tasty -and flaming -desserts when the flames became a little too lively. The exhaust fan ignited and the ensuing fire damaged the ventilation system and other parts of the kitchen. Petite has been closed ever since. But Alvey and co-owners Deirdre Malone and Doug Rasberry are looking at the silver lining of the fire. They had already submitted plans to the city for a summer expansion of Petite, so they are incorporating those plans into the fire renovations. When the plans are (hopefully) approved, Petite will expand into neighbouring space, increasing their size 21/2 times. When it's finished, there will be a new waiting area and about 65 seats. The owners anticipate the process will take four to six months, so look for Petite to reopen sometime this summer. And with 65 seats, maybe they should look at a revision to the name. Moyen perhaps? A bit of an update, Petite decided to relocate to a new, larger space on 17th Avenue SW. No word yet on what's happening with their old space in the Cushing building on 10th Avenue... Also keeping an eye on the old Cushing house on Centre Street SW. It is unoccupied and there were concerns that it might be lost to redevelopment, but it seems more likely now that it will continue to have a life - it would be a great venue for many kinds of uses. Wishing for the best for both Cushing places, and to Petite at their new location. The Cushing Mills buildings were closer to Blacfoot underpass than Cushing bridge. Some people believe that part of a building can be seen there near 9th Ave but not sure since Jenkins built their warehouse there later.